"After 10 years of working in the travel industry, it's easy to spot talent. Lynnell brought a brand of eco-tourism to my hike that I had not seen before. 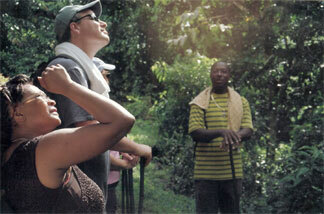 Lynnell E. Liburd is the owner/operator of Sunrise Tours established in 1990. Lynn was born in Maynard Ground and raised in Taylor’s Pasture & Rawlins. Lynn’s great grandfather, Samuel Liburd, Nevis’ last Mountain Ranger, would take the young lad on Sunday afternoon walks educating him to the history and diverse nature found on the island. It was these initial experiences that bred into Lynn a love of the island, history & ecological importance inherited by each one of us. He attended Gingerland Primary and High School as well as college in St. Kitts. In 1984 he left to go North America and lived in various cities along the Eastern seaboard. It was while in Puerto Rico that he was re-sensitized to the environmental aspects of the rainforest. He held various positions allowing him to return to Nevis and excel utilizing his past personal experiences in ecology, sales, P.R., diplomacy and adaptability. Lynn continued the same generational teaching and has passed his lifetime of information to his son Kervin who now joins the family company imparting the same love of and sharing of knowledge so consistent with his father's. It is with these skills that he has been able to fashion Sunrise Tours into one of the premier hiking/tour companies on the island. 2006 - MTV Tempo - 2 episodes with Lynn and Sunrise Tours hiking Nevis; Caribbean Travel & Life Magazine, July issue; Islands Magazine, November issue. 2005 - Highlighted on the USA Network, Two Days In Paradise, doing a documentary on the local medicinal plants and their healing values; O.K. Magazine; Coastal Living; Daily News Advertising Supplement, NY Daily News, Escape to the Caribbean, Oct 2, 2005.